• The maced mom of LeBron James. • Dwyane Wade's crack addict mom. • Drew Brees' opportunistic politician mom. 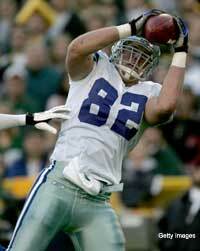 To add to the list: Jason Witten's forging momma. According to investigators, Kimberly Witten said she obtained McQueen's bank account information from a statement that was mistakenly delivered to her mailbox. Kimberly Witten said she had experienced financial difficulties and began withdrawing funds from McQueen's account. Police charged Kimberly Witten with 25 counts of forgery and theft over $1,000. Kimberly Witten is out of jail. She is scheduled to appear in court July 31. We would ask why Jason couldn't, you know, help out his moms a bit, but what do we know? We think she should probably run the players union, though.